The e-Max Tonno includes all the features of the Trifecta soft folding cover, with the added convenience of folding up to the cab at a 90 degree angle for full bed utility. Full Bed Access Extang e-Max Tonneau is a soft folding cover that folds up at the front to offer full bed access. Secure Extang e-Max uses an exclusive Secure Shut Latching System to keep cargo protected. Quick Release Support rods with quick release ball-stud mounts are easy to operate, and provide strength in the up position while driving. Dependable Quality e-Max Tonno, like all Extang products, is proudly made in the USA with the best materials and attention to detail. We back our work with a Maximum Strength Lifetime Warranty. The vinyl cover and folding frame of the eMAX comes completely assembled. The eMAX tonno does not require any drilling to install. Simply mount two base rails to the truck bed using a ½" socket and link the cover portion to its base. Extang's patented Speed Klamps quickly fasten underneath your truck bed rails at the rear of the bed to fold it toward the cab. To fold the cover upright, pull a cable to release the patented SecureShut latch and secure the prop rods and straps to hold it open in the upright position. Made out of heavy-duty vinyl, the Extang eMAX tonno was built to protect your truck bed and everything you need to haul. It adds protection from the wind & rain, plus keeps everything out of the sight of prying eyes. The aluminum frame is very durable as well as lightweight, making it easy to mount and ensuring fast truck bed access. Easy installation makes adding an Extang eMAX to your truck simple and fast. Featuring the popular tri fold design, the eMAX tonno is sure to be a great addition to Extang's truck bed cover line-up. The sleek and stylish design also improves aerodynamics. This tonneau decreases wind resistance, saving you cash at the pump. 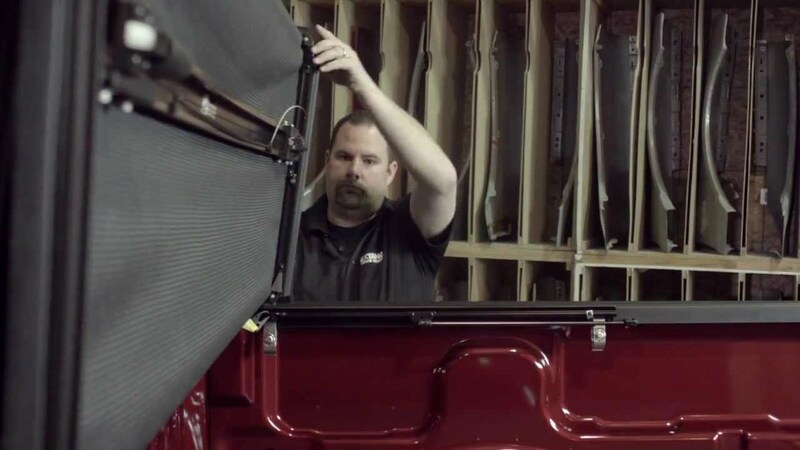 The e-Max tonno cover can be installed on your pickup in minutes. It has an easy clamp-onn installation. Each product\ comes with easy to understand vehicle specific installation instructions. Wind whip damage — Tarps must be secured at all points when vehicle is in motion. An unsecured tarp will flap, resulting in damage to the fabric. Improper cleaning — It is recommended to use the tested and approved Extang Tonno Tonic or clean with soap and water only. Do not use vinyl conditioners (i.e. Armor All) because they will shrink the vinyl. Overloading of cargo — Cargo should not touch the tonneau at any point. Protrusions in the tarp will stress the fabric. Cargo may shift while traveling and cause it to push against the fabric or panels and damage it. Driving with panels open or improperly secured on all folding tonneaus — Prior to vehicle operation, clamps must be tightly secured so that clamp lips tightly grip the inner bedside metal surface. Open position: Tonneau must be completely folded and secured with BOTH buckles. Closed position: Tonneau must be completely flat and secured at all 4 clamps. Opening panels without removal of debris on all folding tonneaus — Top of tonneau MUST be free of foreign material including snow and ice before opening panels or severe damage may result. Towing — Do NOT tow your vehicle from the rear with any Extang tonneau cover on your truck.